A Pale Horse Named Death is a new project from Life of Agony�s Sal Abruscasto; he is also a co-founder of Type O Negative with Peter Steele. A multi-instrumentalist, Abruscasto switches from drum to guitar and vocals on the debut And Hell Will Follow Me. The band is rounded out with friends and past associates including drummer Johnny Kelly (Type O Negative, Seventh Void), Bobby Hambel (Biohazard) on guitar, Matt Brown (Supermassiv, Seventh Void) also on guitars and Eric Morgan on bass. As a fan, you'll probably hear the influences of Abruscasto's past and present work within And Hell Will Follow Me. Generally, AHWFM (any more abbreviations?) is heavy, dark, foreboding, and quite interesting. Listening to Bad Dream (a short instrumental), Heroin Train, or Pill Head APHND sounds like Pink Floyd married with TON on a dose of steroids or Smilin Bob's Enzyte. Ultimately, the deep impressions of And Hell Will Follow Me only purpose seem to be to max out or completely blow the woofers in your speakers. That is to say if you actually have a real stereo system. (Shame on you if you don't, you digital dimwit.) Meet the Wolf and Serial Killer deliver pounding intensity, enough to threaten even the best column speakers. Whatever you do, don't start these songs with your volume already set high; you will blow out the rear speakers in your auto or elsewhere. APHND is heavy, deliberate, and forceful throughout. It's heavy, near doom, rock and metal with roots in the past and an eye to the present. It's sufficient for interest of longtime fans of Abruscasto's resume. But for pedestrian accessibility, it's a pass. But that's not important here. This is lurking underground metal: heavy, doom, old school, or otherwise, it's worth the interest of the adventurous. 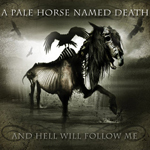 A Pale Horse Name Death's And Hell Will Follow Me is lurking underground metal: heavy, doom, old school, or otherwise, it's worth the interest of the adventurous.